During the Ultrasound-Guided Fine Needle Aspiration Biopsy of the Thyroid radiology procedure, a small sample of thyroid gland tissue is removed and examined under a microscope, in order to determine whether it is benign or malignant. 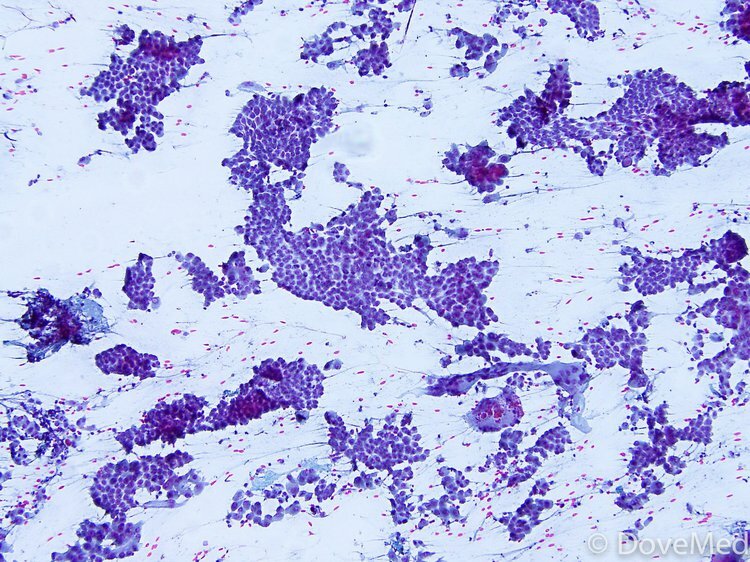 This is a microscopic pathology image of a thyroid nodule showing a papillary carcinoma of thyroid on a fine needle aspirataion (FNA) biopsy smear. The Ultrasound-Guided FNA Thyroid Biopsy involves the neck region of the body. Why is the Ultrasound-Guided Fine Needle Aspiration Biopsy of the Thyroid radiology procedure Performed? There have been no recent advances to replace the Ultrasound-Guided FNA Thyroid Biopsy procedure. What is the Cost of performing the Ultrasound-Guided Fine Needle Aspiration Biopsy of the Thyroid radiology procedure? The cost of the Ultrasound-Guided Fine Needle Aspiration Biopsy of Thyroid procedure depends on a variety of factors, such as the type of your health insurance, annual deductibles, co-pay requirements, out-of-network and in-network of your healthcare providers and healthcare facilities. It is normal for a patient to feel uncomfortable and confused with a sudden inflow of information regarding the USG FNA Biopsy - Thyroid procedure and what needs to be done. How does the Ultrasound-Guided Fine Needle Aspiration Biopsy of the Thyroid radiology procedure work? How is the Ultrasound-Guided Fine Needle Aspiration Biopsy of the Thyroid radiology procedure Performed? A USG Fine Needle Aspiration Biopsy of Thyroid procedure is performed as an outpatient procedure, at a hospital. A USG Fine Needle Aspiration Biopsy of Thyroid procedure is usually done by a radiologist or a qualified healthcare professional with the assistance of a radiology technologist. Normally, the Ultrasound-Guided Fine Needle Aspiration Biopsy of Thyroid procedure takes about 20 minutes. A physician will request your consent for an Ultrasound-Guided Fine Needle Aspiration Biopsy of Thyroid procedure using an Informed Consent Form. What are the Limitations of Ultrasound-Guided Fine Needle Aspiration Biopsy of the Thyroid radiology procedure? What is the Ultrasound-Guided Fine Needle Aspiration Biopsy of Thyroid procedure? What is to be expected during the Ultrasound-Guided Fine Needle Aspiration Biopsy of the Thyroid radiology procedure? A general anesthesia will be injected to numb the path of the needle, during the USG FNA Biopsy – Thyroid procedure. There is only a minimal blood loss, during the USG Fine Needle Aspiration Biopsy of Thyroid procedure. What are the possible Risks and Complications during the Ultrasound-Guided Fine Needle Aspiration Biopsy of the Thyroid radiology procedure? During the procedure, there is a slight risk of infection, since the skin is penetrated by a needle. However, this risk is very low; it is less than 1 in 1000 procedures. What Post-Operative Care is needed at the Healthcare Facility after the Ultrasound-Guided Fine Needle Aspiration Biopsy of the Thyroid radiology procedure? There is no postoperative care necessary after the Ultrasound-Guided Fine Needle Aspiration Biopsy of Thyroid procedure, at the healthcare facility. What is to be expected after the Ultrasound-Guided Fine Needle Aspiration Biopsy of the Thyroid radiology procedure? If there are any signs, such as swelling, bleeding, or redness in the breast following an Ultrasound-Guided Thyroid Biopsy procedure, the physician should be informed about it. What Post-Operative Care is needed at Home after the Ultrasound-Guided Fine Needle Aspiration Biopsy of the Thyroid radiology procedure? There is no postoperative care required after the Ultrasound-Guided FNA Biopsy of Thyroid procedure. The patient may return to their normal activities 24 hours after the USG FNA Biopsy of Thyroid procedure. Who will you receive a Bill from, after the Ultrasound-Guided Fine Needle Aspiration Biopsy of the Thyroid radiology procedure? The patient is advised to inquire and confirm the type of billing, before the Ultrasound-Guided Fine Needle Aspiration Biopsy of Thyroid procedure is performed.